About What is the Vincentian Charism? The word “charism” is used to describe a particular spiritual orientation, and any special characteristics of its mission or values (for example, the works of a teaching order as compared with that of a missionary order, or one devoted to care of the poor or the sick). 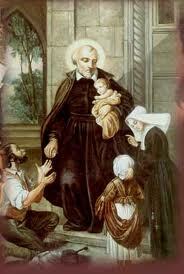 Vincentian charism refers to the teachings of St. Vincent de Paul, the 17th century priest who, along with St. Louise de Marillac, established the Company of the Daughters of Charity in Paris in 1633. St. Vincent embraced humble and grateful service to others, especially to those who are poor. Concern for the whole person – body, mind and spirit: this holistic approach to caring translates to all of our ministries – education, social services, health care, missions and spiritual formation. The first foundation made by Vincent de Paul was for lay women in 1617, when he experienced a personal conversion that led him to discover the pervasiveness of poverty in his day. He responded with bold initiatives to address these social problems. Vincent’s integration of evangelization and charity became the Vincentian charism. Notably, from the beginning the role of the laity was pivotal for his mission.